George starts dating a college friend who, thanks to Jerry, thinks George is now a marine biologist. Elaine's electronic organizer injures a person after being launched from a limo by a Russian novelist. Kramer decides to golf on the beach. Elaine Benes: [talking with Lippman and Testikow in the limo about "War and Peace"] Although one wonders if "War and Peace" would have been as highly acclaimed as it was if it was published under its original name "War: What Is It Good For?" Elaine Benes: Yes, Mr. Lippman. It was his mistress who insisted he called it "War and Peace." "War - What Is It Good For"
Elaine Benes: The song got that line got from Tolstoy. Lippman: I'm sorry. It's just her sense of humor. Season 5, Episode 14, "The Marine Biologist"
"The Marine Biologist" is possibly the best episode in Seinfeld's fifth season, and one of the best in the whole series. 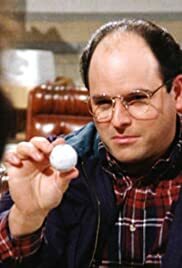 While other episodes usually had two, three or four parallel story lines, here George is the clear star of the episode, and Jason Alexander delivers some of his best, most hilarious acting. His monologue at the end of the episode, in particular, is genius and one of the finest moments in the series. That's not to say that the other actors don't pull their weight. Elaine has some hilarious moments, and Kramer has brief but fantastic scenes. Rosalind Allen and Carol Kane drop by for great guest appearances. All around, one of the very best episodes of this wonderful show.